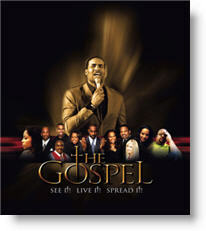 Screen Gems (Sony) is releasing a new faith-based drama titled The Gospel in theaters throughout the U.S. on October 7, 2005. The story explores the inner-workings of a Christian church. Told from the perspective of the pews, the film attempts to give a realistic portrayal of people dealing with true life struggles and issues. The drama draws its inspiration from the biblical parable of the prodigal son. Featured are some of todays biggest names in gospel music. The producers say they are trying to provide inspirationally uplifting entertainment for the entire family. Playing the lead role is actor Boris Kodjoe, star of UPN’s “Second Time Around.” The Director/Writer is Rob Hardy of Rainforest Films, Marrietta, Georgia (www.rainforestproductions.com). See our movie review page for more information.